We've repeatedly sat down and spoken with our Industrial Soldering Stations about their behavior. We've pleaded with them to 'play nice'. But there is just no getting through to them...they continue to bully all the other high-tech soldering stations on the playground! All jokes aside, our industrial stations are unique. They offer the high thermal capacity of our production-ready pencil-style soldering irons combined with amazing controllability. All the other stations on the market are focused on ensuring you are soldering at a specific temperature. 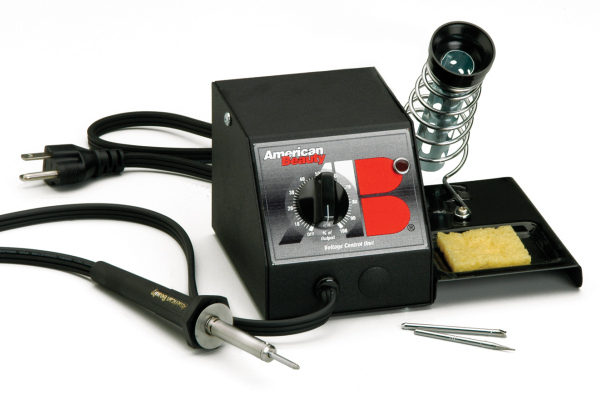 Our American Beauty Industrial soldering stations are designed and built to perform under the most demanding production line conditions and withstand rugged usage in all maintenance and repair operations. We are focused on ensuring you have enough heat. Soldering Stations come with multiple tips and include a detachable soldering iron holder with tip cleaner.